Updated in a new 6th edition, America’s New Democracy provides an engaging, analytical approach to American Government that stresses the importance of elections in contemporary American politics. 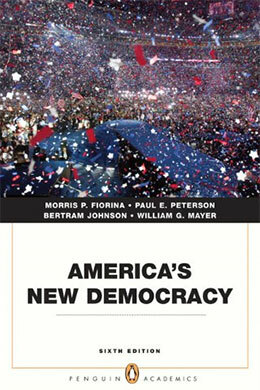 Written in a strong narrative voice it provides a focused and stimulating treatment of politics in the United States. The book challenges the pessimistic view that government seldom listens to ordinary people by illustrating popular influence across the political system in defense of a central theme—-that elections matter more in America’s political system today than they have in the past or do in other democracies.